The 2019 European Wrestling Championship is underway in the Romanian capital city of Bucharest. 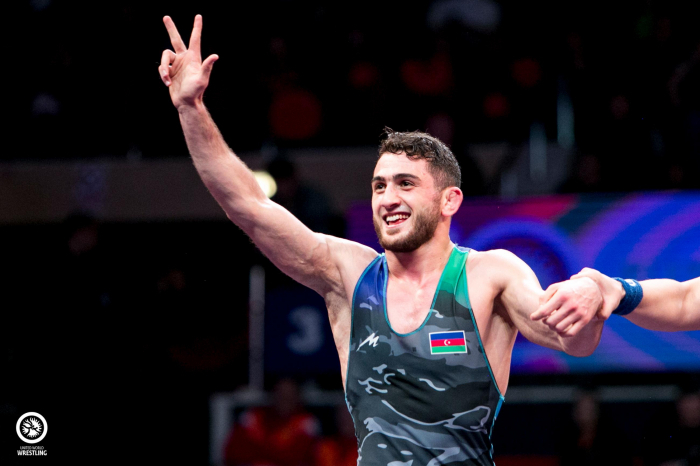 Azerbaijani wrestlers Haji Aliyev and Jabrayil Hasanov reached the top of the European podium for the third time in their careers and helped Azerbaijan carry a five-point lead over the Russian Federation into the final day of freestyle wrestling at the European Championships, AzVision.Az reported. Another Azerbaijani wrestler Jabrayil Hasanov won his third European title after receiving an injury defeat in the 79kg finals. Jabrayil Hasanov was the second Azerbaijani who won a European title on the second day of wrestling at Bucharest’s Pollyvalent Hall. Though it wasn’t the way he wanted to win, the reigning world runner-up won his third European championship with an injury default win over Akhmed Gadzhimagomedov (RUS) who was unable to compete after injuring his right knee on Monday night in the semifinals.